It seems that chess set creators will go to any lengths to out do each other and travel chess sets are no exception. There are some pocket travel chess sets that are really really tiny, with boards spanning no more than a couple of inches. The pieces for these chess sets are really miniature and in cases of mass produced sets often lose definition and become hard to tell one piece from another. So while you can buy a set that will literally fit in your shirt pocket, lack of practicality might get the better of it. Travel chess sets are extremely popular. The concept usually consists of a wooden cabinet which is hinged in the centre and contains the chess pieces inside. This method is not just applicable to small compact sets, indeed it's not unusual to see sets up to twenty inches in size built in the same way, although the term travel chess set certainly wouldn't apply to sets this big. It's fair to say that travel and folding chess sets are seldom as nice as a dedicated chess set and flat solid board. What they lack in style and elegance they make up in practicality and space saving convenience. Taking the travel chess set concept a step further has seen the introduction of magnets to give ultra portability and stability to the sets. The really small folding sets benefit hugely from magnets, it makes what would otherwise be a fiddly set quite stable and highly usable. The way the magnetic travel chess set works is by inserting little magnets inside the chessmen via their base. The magnet is then covered up with a thin felt circle. A flat piece of steel is then hidden underneath the wooden squares so the magnets will stick to the squares. This is great if you are playing chess on a small board and risk knocking it around. 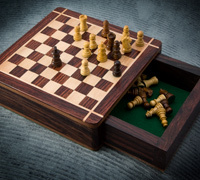 A good quality magnetic chess set will have magnets strong enough to hold the pieces on while the board is turned upside down but let those pieces be moved around the board without excessive force needed to remove them from their square.